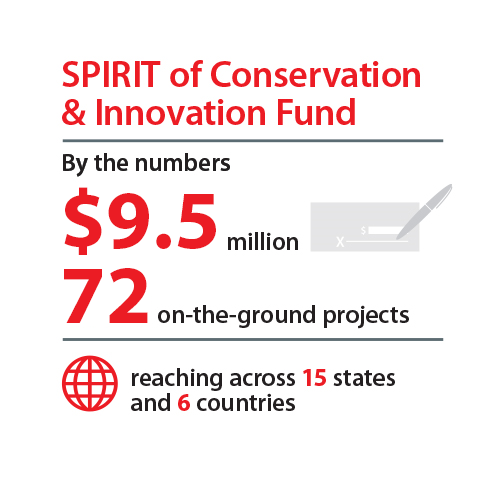 Through a partnership with the National Fish & Wildlife Foundation, the ConocoPhillips SPIRIT of Conservation & Innovation Fund is structured to support the development of innovative ideas, tools and techniques to advance and promote leading-edge solutions to complex water and biodiversity conservation challenges across the globe. Since 2005, more than $9.5 million has been invested in 72 on-the-ground projects across 12 states and five countries. Grantees have matched this funding with an additional $21.3 million for a total conservation impact of $30.8 million. In 2016, the SPIRIT of Conservation and Innovation Fund granted $1.2 million in direct support of 9 projects. With matching funds, the total on-the-ground conservation impact totaled more than $8.3 million. These funds will be used to restore over 16,300 acres of grassland bird, prairie and wetland habitat. Additionally, the grants will provide improved capacity to support critical habitat for migratory and grassland birds, increase the number of oyster reefs, and develop a new innovative aquatic invasive species cleaning station to help prevent the spread of invasive species. For additional details on the 2016 individual grants, please click here and for information about past awards please click here.